On 8 April, in line with the schedule set by Energy Minister Sigmar Gabriel (SPD), the German government adopted a bill amending the EEG (Renewable Energy Sources Act). The aim, as officially stated, is to cut the costs of supporting renewables, as from 1 August 2014, by increasing the exposure of renewable energy sources to market forces, while ensuring continued renewable growth. The final bill will also include provisions for reducing the EEG surcharge for energy-intensive industries, following the conclusion of discussions with the European Commission (on 7 April). The reformed EEG, EEG 2014 (aka EEG 2.0), applies to all new renewable plants starting operation on or after 1 August 2014, although certain grandfathering rules also apply. The following is a summary of the main provisions (although it should be noted that, at the time of writing the new renewables law is still just a bill, and that the final version, after the parliamentary process, may be different, so what is presented here is preliminary and not final). Renewables targets, expansion "corridors" and "breathing caps"
Renewable energy growth will be encouraged so that renewables have a share of 40-45% of total electricity production by 2025 and 55-60% by 2035 (for comparison the 2013 figure was about 23.8% according to BDEW (German Association of Energy and Water Industries)). The bill introduces what are described as new expansion "corridors" (essentially boundary conditions) - for the support of renewable power plants under the EEG so as to achieve steadier growth and avoid sharp cost increases. Biomass: annual growth of 100 MW, gross amount, again with only new capacity counted, so no deductions of capacity that has been decommissioned, and new capacity arising from expansion of existing biomass power plants not counted in the annual growth target. To ensure compliance with the corridors, so-called "breathing caps" are introduced for onshore wind and biomass, modelled on the existing "breathing cap" for solar power. This means that financial support for onshore wind power and biomass under the new EEG is reduced quarterly (not annually) as of 2016 and can increase or decrease if growth exceeds or falls below the targets. The existing breathing cap for solar power is tightened with regard to the thresholds and the applicable additional support reductions or increases. Presently, most renewable power plant operators can receive feed-in tariffs. Operators can also voluntarily decide to sell green electricity directly and claim a marketing premium in addition to the revenue obtained. Under EEG 2014 direct marketing will be the rule, and only in exceptional cases will the operators of renewable plants receive feed-in tariffs. One exception is small renewable power plants, in particular: plants commissioned before 1 January 2016 with an installed capacity of less than 500 kW; plants commissioned after 31 December 2015 and before 1 January 2017 with an installed capacity of less than 250 kW; and plants commissioned after 31 December 2016 with an installed capacity of less than 100 kW. 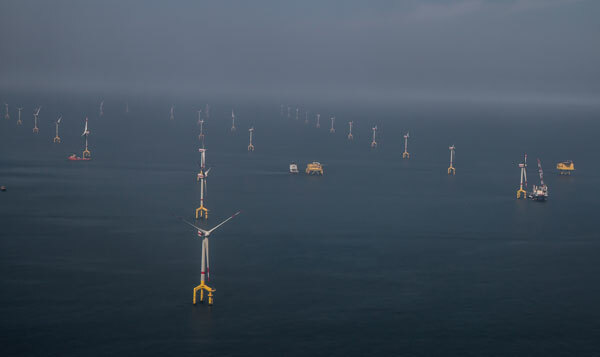 The applicable feed-in tariffs for these small plants will be reduced by 0.4 cent/kWh for wind (onshore and offshore) and solar energy, with a reduction of 0.2 ct/kWh for all other renewable energy sources. There are other exceptions, for example, if operators are unable to market the energy directly. In this case, however feed-in tariffs are reduced by 20% to incentivise direct marketing. According to the proposed EEG 2014 legislation, financial support for renewable energy sources will be determined through auctions by 2017 at the latest. In moving towards this the new auction (or tender) based system EEG requires that experience be gained in pilot projects with freestanding PV power plants, the auctions for which will be organised by the Federal Network Agency. While at the time of writing the provisions of the EEG relating to surcharge reductions for energy-intensive companies had not been set out in the draft bill, provisions for granting EEG surcharge reductions for rail operators were included. Basically, under the new law, rail operators can apply for an EEG surcharge reduction if they can demonstrate that the electricity consumed for railway operations at a delivery point (excluding energy retransmitted) amounted to at least 2 GW in the previous fiscal year. The EEG surcharge will then be reduced to 20% of the applicable surcharge. Under EEG 2012, self-generated and self-consumed power is exempted from the EEG surcharge if the electricity is not transmitted via a grid or used in the vicinity of the electricity-generating installation. The Economics and Energy Ministry initially wanted not only to make new plants for self-use contribute 90% of the EEG surcharge, but also freeze the EEG exemption for existing plants at the 2013 EEG-surcharge level, so that plants would have had to pay a rising surcharge. Following talks with the federal states, the government made concessions, and EEG 2014 includes the following provisions for EEG-surcharge exemptions and reductions. Under the EEG 2014 the following power plants are exempted from the EEG surcharge if the electricity is not transmitted through a grid or used in the vicinity of the installation: existing plants (defined in various ways); plants that are neither directly nor indirectly connected to a grid; consumers that source their electricity 100% from renewable sources and do not claim support via the EEG for electricity that they do not need themselves; small plants, with an installed capacity of up to 10 kW and generating no more than 10 MWh/y of self-consumed power. The provision applies for 20 years from the commissioning date. New plants intended to provide power for self-consumption will benefit from the following EEG surcharge reductions: 50% reduction for renewable power plants and high efficiency CHP plants; 85% reduction for all other power plants if the user of the self-generated energy is a manufacturing company. As already noted the basic aim of EEG 2014 is to cut renewables support costs. Initially, the government wanted to reduce the average support costs across all renewable technologies from around 17 ct/kWh under the current EEG (feed-in tariffs, plus bonuses/premiums) to 12 ct/kWh for new installations by 2015. This has been very slightly watered down in concessions made by the government to the federal states, but the adjustment only amounts to about 0.2 ct/kWh by 2020. Whether the EEG reform will be enough to stabilise the EEG surcharge (paid by all electricity users except "privileged" consumers, eg energy intensive industries) at the current level (6.24 ct/kWh for 2014) over the long-term is doubtful. It has been suggested by the Centre for European Economic Research that the EEG surcharge could rise to 8.3 ct/kWh within five years, whereas Minister Gabriel hoped that with the current reform, the EEG surcharge could at least remain stable until 2017. Thanks to the increasing share of renewables and falling wholesale electricity prices, the EEG surcharge has risen steadily over the past ten years: from 0.41 ct/kWh in 2003 to 5.277 ct/kWh in 2013. What now: when will EEG come into force? Bundesrat (Federal Council): first round, 8 April 2014. Response from cabinet: usually within 3 to 4 weeks. Bundestag (parliament): first reading/committee phase, started 8 May 2014, second and third reading possibly in June 2014/last week before summer recess (30 June to 4 July 2014). Bundesrat: possibly in last sitting before summer recess (11 July 2014). Entry into force: presently scheduled for 1 August 2014.